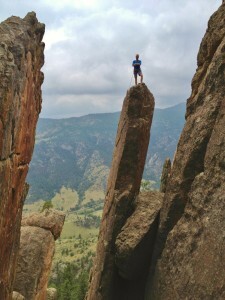 Coolibar Athlete Sevve Stember is a natural born climber, always seeking the next mountain to climb. 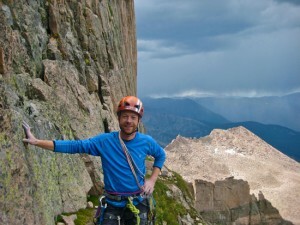 This summer, he and his wife, Andrea, moved from Minnesota to Colorado to pursue new opportunities and climbing routes. 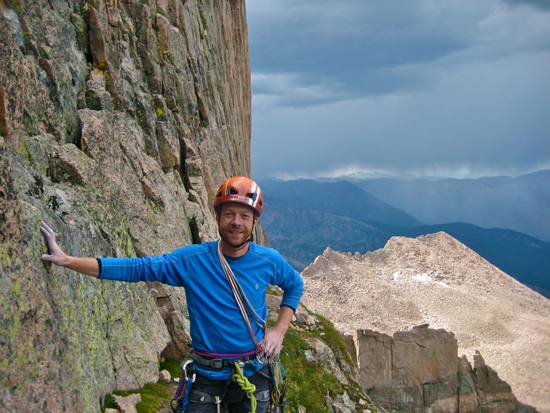 Sevve shares why climbing is important to him and journals his favorite moments during his first summer in the Rocky Mountains. We all seek to belong to something and to be understood. In climbing, I’ve found more like-minded people that I can connect with on many levels than I could’ve ever imagined. The journal entries below are all really special days in my life that I will look back on with fond memories and good times. Despite the obvious individual aspects of climbing, there are many profound implications that climbing has on the people that share it together. Trust, sacrifice, failure, success and frustration…these feelings are shared with my climbing partners through a common love of being outdoors and challenging oneself. When working in Yosemite National Park, I used to share this quote with visitors as an eloquent way of getting at the significance wilderness has to a person. There are many different belief systems about how the world came to be. For instance, as a science teacher, I believe the world is very old and has been slowly changing for billions of years. When climbing, I can connect with the many different processes that occurred before I could enjoy its continuous crack system or perfectly sculpted pockets. Being in nature helps humans tap into a state-of-mind that is hard to come by elsewhere, it helps us connect with our beliefs—whatever they might be. 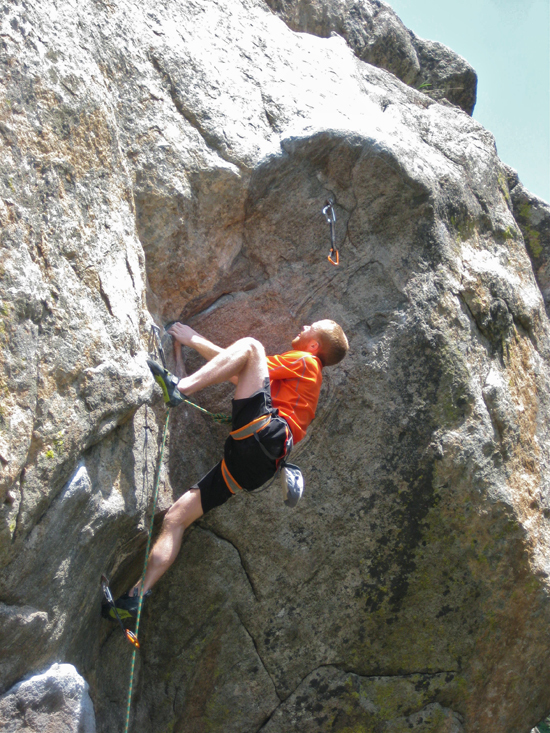 Climbing routes are graded by difficulty, providing climbers with data to see personal improvements. Personal growth is something that drives me in all aspects of my life. The motivation I receive from trying to climb harder routes spills over into other aspects of my life, such as being a better teacher or learning how to be a more supportive husband. This matters because it helps me be a more productive, efficient and passionate member of society. It was a summer to remember, to say the least. Seeing new sites, sharing beautiful vistas with friends, sleeping under the stars with my wife, and I continue to learn along the way. Although at times I do have doubts about how I spend my time, I know that finding that thing that drives me to new places: good friends, higher goals, are critical to living a fulfilling life. After a fantastic evening on my aunt and uncle’s back porch in Rapid City, South Dakota, Andrea and I stopped briefly for a couple climbs in Spearfish canyon. We were closing in on the final leg of our move from Minneapolis, MN to Denver, CO. I hung draws on a route called “Wow!” and climbed it on my next try without falling – very gratifying! 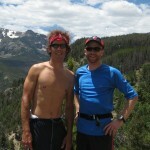 Today I met Matt and Linde, friends of mine from Minnesota, in Boulder, Colorado. We climbed a 4-pitch route (route with four stops) called “Athlete’s Feet”. Towards the top of the route a large thunderstorm rolled in, and we descended just as the first drops hit. 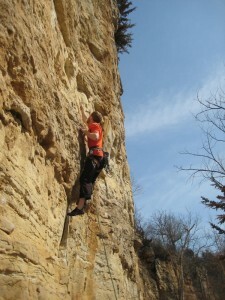 Linde met us and we rolled to a different crag (an outcrop of rock) to do some shorter, harder sport climbing routes. Matt is a climber that I looked up to a lot when I lived in Duluth, MN years ago; it was fun to swap leads with him all day and work a route that we both got on our second attempt. Eldorado Canyon is known as one of America’s premier climbing destinations. I had never been there before today. Frank, a good friend of a friend, and I climbed the classic “Bastille Crack”. It was great to experience a new piece of American climbing history while getting to know a new friend. Being the patriotic people we are, my friends Garrison, Dan, Frank, Katie and I headed into the heart of the Big Horn mountains of Wyoming to celebrate the 4th of July with some real cowboys. I’ve driven through Tensleep before, but never had the pleasure of climbing there. It was phenomenal to say the least. I set several benchmark onsights (climbing a route first try without any information) and flashes (first try; but with prior information). The trip was complete when we saw a full on cowboy brawl during the street dance. 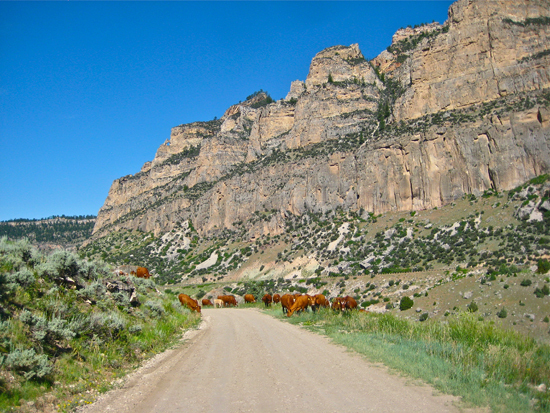 Wyoming must be the most unchanged state over the past 50 years. My buddy Dommer flew in for the weekend and we headed north towards Estes Park. 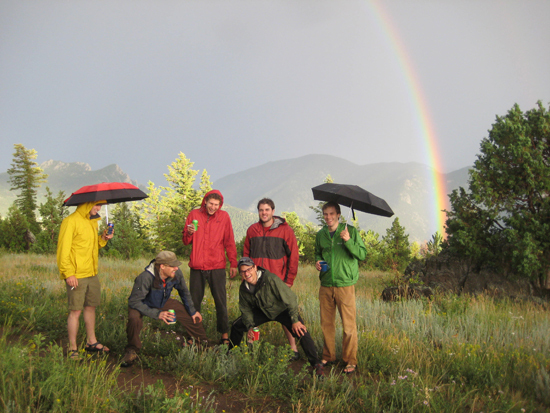 A good crew of friends were waiting for us upon arrival, and as we waited out an evening storm a double rainbow appeared over the breathtaking view of Longs Peak. 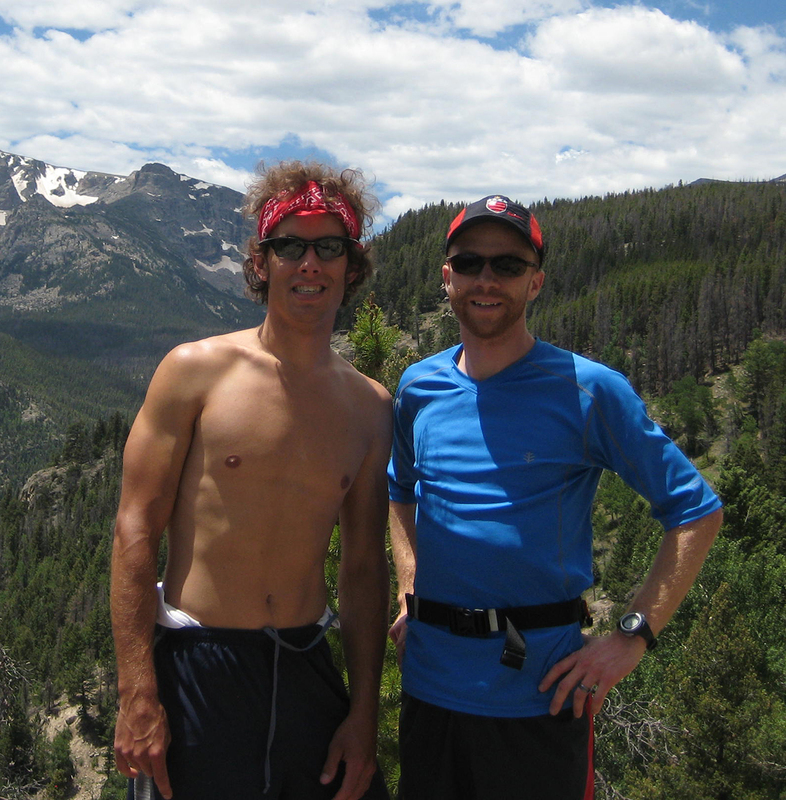 The next day, we climbed granite spires and soaked in the sun. 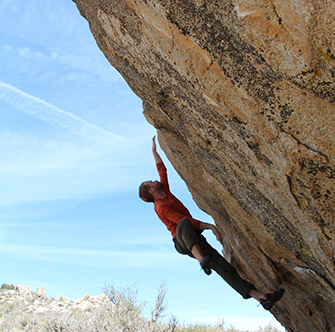 Rifle is one of the most sought after crags in the American sport climbing scene. My wife Andrea had a week off from her residency duties and we took the chance to go check it out. From the parking lot, the approach was about two minutes. Once the sun hit the side of the canyon we were on, we’d walk two minutes to the other side of the canyon. Such good rock! Although Rifle has a reputation of being super challenging, I was encouraged by how I climbed while visiting. 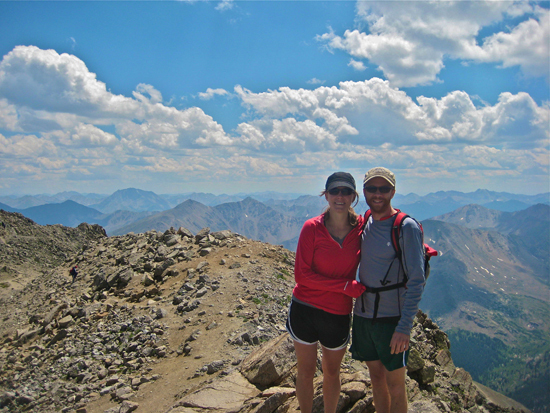 We also tagged the summit of Mount Massive, with a not-so-alpine-start, leaving the parking lot at 11am. Summer draws to a close. Our friends Dan, Bron and their son traveled from Minnesota to visit for a couple days. 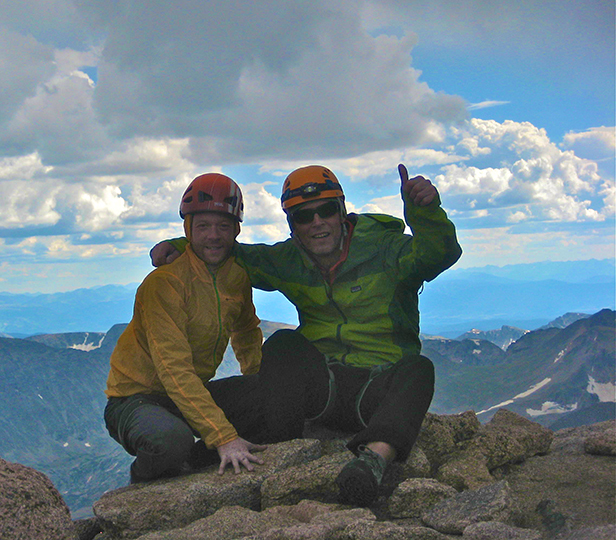 Dan and I had been getting stoked all summer to climb the face of Longs Peak; a feature called The Diamond. 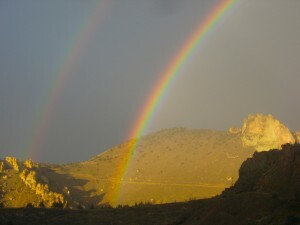 In 2007, while living in the Black Canyon of the Gunnison, I became familiar with The Diamond. Since that summer, I had always dreamed of climbing it. We woke up at 1:30 a.m., slammed coffee and jammed to tunes on the five mile drive to the parking lot. 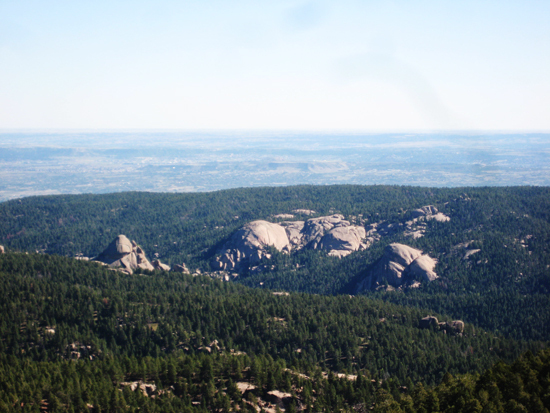 Amidst dozens of peak baggers, we quickly ascended the six mile approach to Chasm View and rappelled onto Broadway ledge, which marks the beginning of the routes on the Diamond. Pitch after pitch went by as we kept a watchful eye to the east. We witnessed many thunderstorms roll in, but to our good fortune, they were always several miles away. I got to lead the crux pitch, which is one of the last pitches on the route so the full day’s toils had definitely taken their toll. I meticulously made my way up the finger crack section, followed by a full on chimney that deposited me onto the final crux bulge. With horrendous rope drag, I managed my way through the crux, and belayed Dan up. An hour later we were on the summit and our luck had run out. Sleet started to fall and we opted to make our way down the Keyhole Route instead of rappelling the Cables Route; which I predicted would have some scrambling on exposed (and recently wet) slabs. We made it back to our car feeling exhausted, but so fulfilled. Dan is embarking on a “50 noteworthy climbs by the time he turns 50 years old” adventure and this was his 1st of 50. I met a personal goal and felt really competent in a complex environment. This was a day to remember the rest of my life. 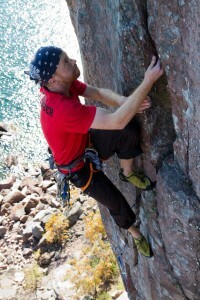 What does a long-distance runner, kayak instructor and rock climber all have in common besides a passion for fitness? Their love for the Coolibar Short Sleeve Fitness Shirt! Since it’s introduction into the Coolibar UPF 50+ clothing line last season, this sweat-wicking, sun-blocking shirt has received more positive feedback than any other dedicated fitness item in the history of Coolibar! Here’s what these athletes had to say. What are your overall thoughts on the shirt? This shirt is an excellent top layer that wicks moisture away from the body. 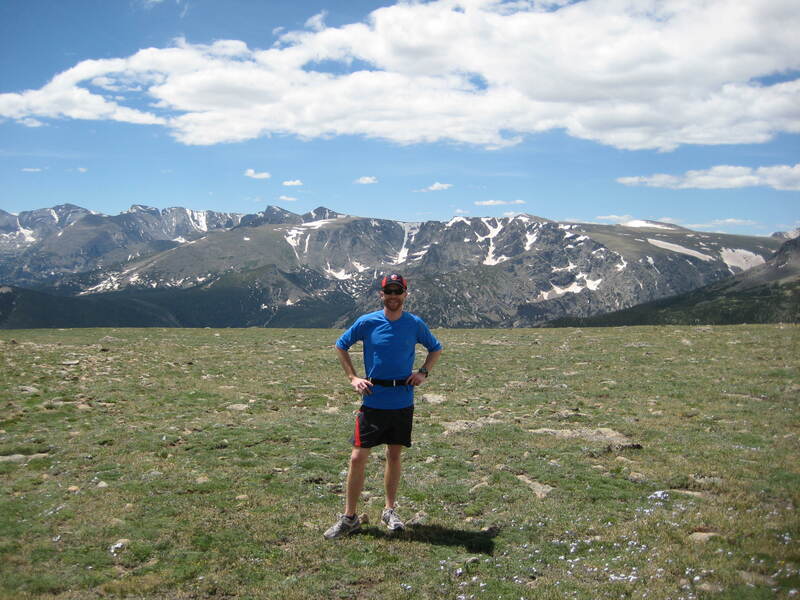 I’ve used it primarily for rock climbing and trail running. It has performed well in both situations and I wear it with confidence knowing that it is also protecting me from the sun. Thoughts on the fabric: I like the fabric. It’s definitely a synthetic, but it wicks well and is comfortable enough. Recently, on a trail run, I submerged the shirt in a creek. As we hiked, the shirt dried in about a half hour. It does not hold water very long, but still keeps you cool. It’s a relatively light-weight shirt. What do you want others to know about this shirt? Its an excellent shirt for outdoor activity. If you are in a wilderness setting and you want a bright color so that you are very visible, these shirts work great. If you want a go to shirt for working out in the city, these shirts are great because they wick moisture while providing solid sun protection. 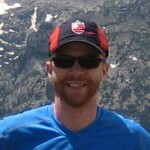 What advice do you have for other athletes regarding sun protection? Any tips to stay comfortable/safe out in the sun? Getting burned is no fun and it’s super dangerous. I always wear a shirt when I am working out in the sun, despite hot temperatures. It’s just not worth exposing that much of my body to the sun. Additionally, I always wear something on my head like a baseball hat or a “dew rag.” This helps keep the sun off my body. What are you overall thoughts on the shirt? Comfortable! The cut and fit felt really good. I wore the shirt during training runs and a segment of a 24 hour race. What are your favorite features? I love the V-Neck! The shirt did not rub or chafe, even after several hours. The fabric is nice, soft and breathable. Did the fabric meet your expectations? Yes. 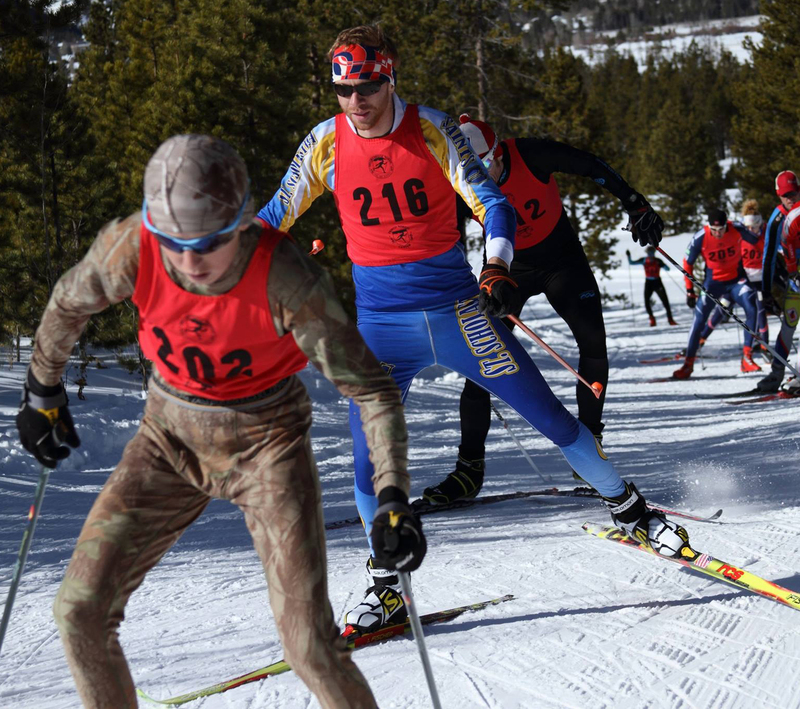 The 24 hour race had temps in the 80’s, did not feel like the shirt “trapped” any heat. What do you want others to know about this shirt? This is a great shirt to wear for any outdoor activity — lightweight, comfortable plus sun protective! 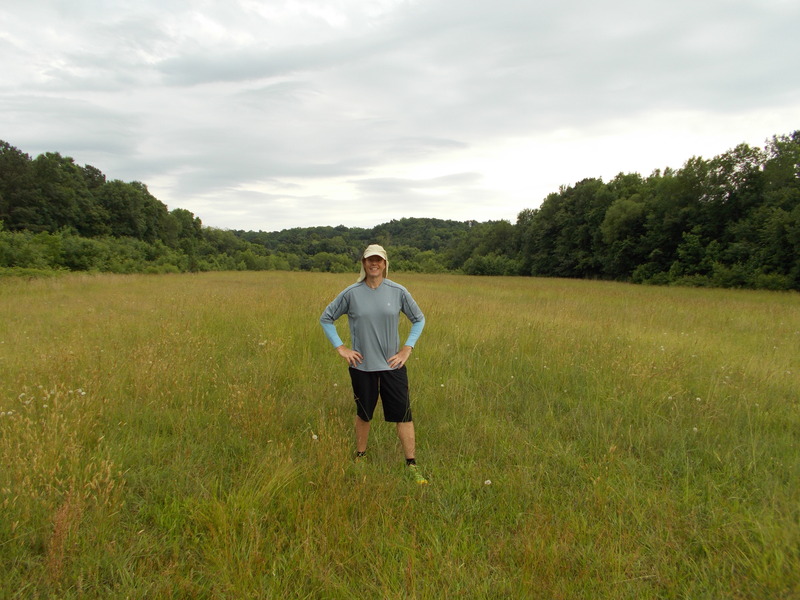 I was really impressed how the shirt remained comfortable even after several hours of running and sweating in it! 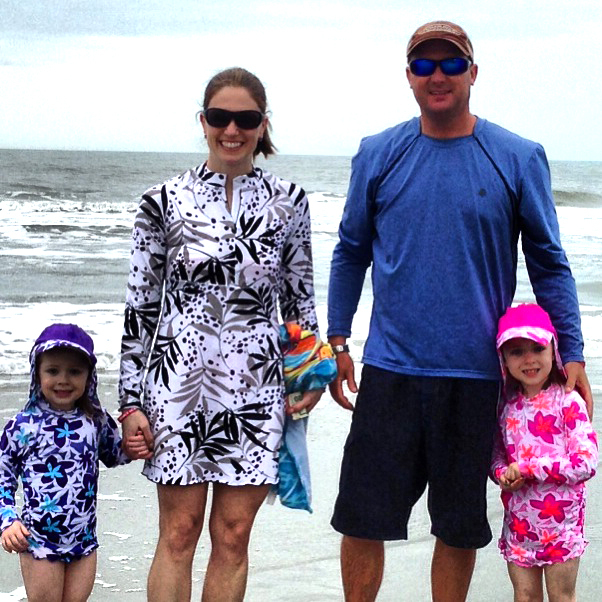 What advice do you have for other athletes regarding sun protection? Any tips to stay comfortable/safe out in the sun? Don’t assume you are not at risk from the potentially harmful effects of the sun! Be proactive and sunAWARE. Run early in the morning or later in the evening when the sun is not as strong (it will also be cooler)! Apply sunscreen, wear a hat. Take it to the trails if you can. Usually trails are shaded by trees and will keep you out of direct sun. What are you overall thoughts on the shirt? 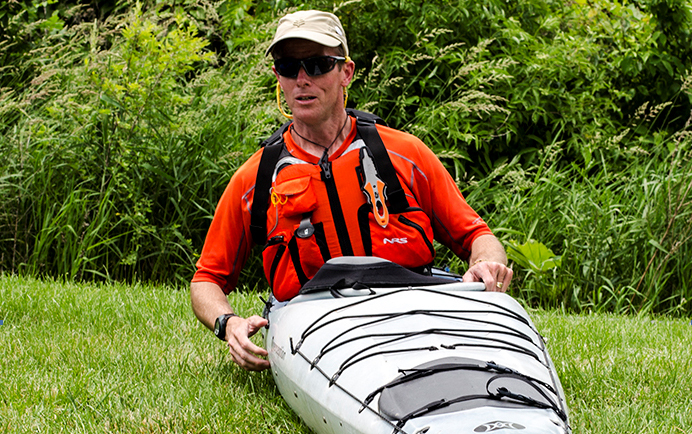 As a kayak instructor, tour leader, and pleasure boater, I spend hours in the sun. Add reflection from the water and you have some pretty powerful rays hitting you. The Fitness Shirt is one of the most comfortable pieces of clothing I have ever worn. The fabric is soft and it fits just right. It’s just loose enough to not bind but not so loose to flap in the wind. Best of all, it looks great and I get compliments both on and off the water. There aren’t too many pieces that look equally as good in the kayak and at a restaurant with my family. What are your overall thoughts on the fabric? It’s very soft, yet it can handle the demands of hard activity. It moves with your body and doesn’t rub. Coolibar athletes received free product for the purpose of this review. Well, this weather has been crazy. My last tournament at Beaver Lake in Arkansas took place the second week of April and there was snow flurries the first morning of the event. After that miserableness, I needed to get out of town because where I live in Minnesota there wasn’t just snow flurries, there was snow still on the ground! So, the family and I headed to Hilton Head Island in South Carolina for some fun in the sun. You see, Avrey had surgery about a month ago that has left a minor scar on her eyebrow that needs to be out of the sun at all times so the scar can heal. 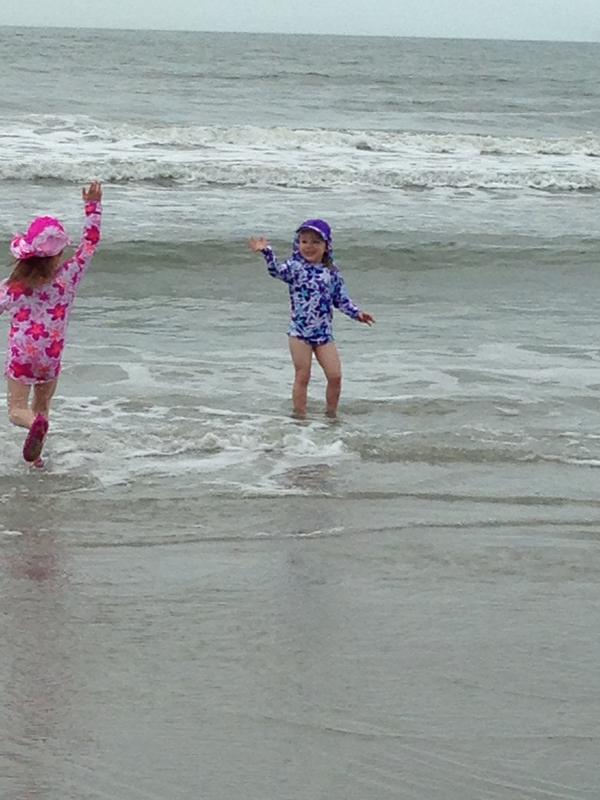 Historically, she has not been the most cooperative when it comes to wearing sun hats, but with the Surfs Up All Sport Hats and Reversible Bucket Hats she and Izzy were dolls and wore a hat at all times in the sun. We all had a great time, saw dolphins, swam in the pool, hung out on the beach and, of course ate too much! I gotta say, I lived in the Pipeline Board Shorts and the short and long sleeved Aqua T-Shirt. Bridget loves the Ruche Swim Shirt, Vera Ruched Hoodie and Summer Wrap. We all can’t wait for the sun to finally shine in Minnesota to get to wear it again! I am off to Oklahoma this week for some practice then on to Lake Eufala in Alabama for a tournament next week. Sun is supposed to be shinning, let’s hope so!! 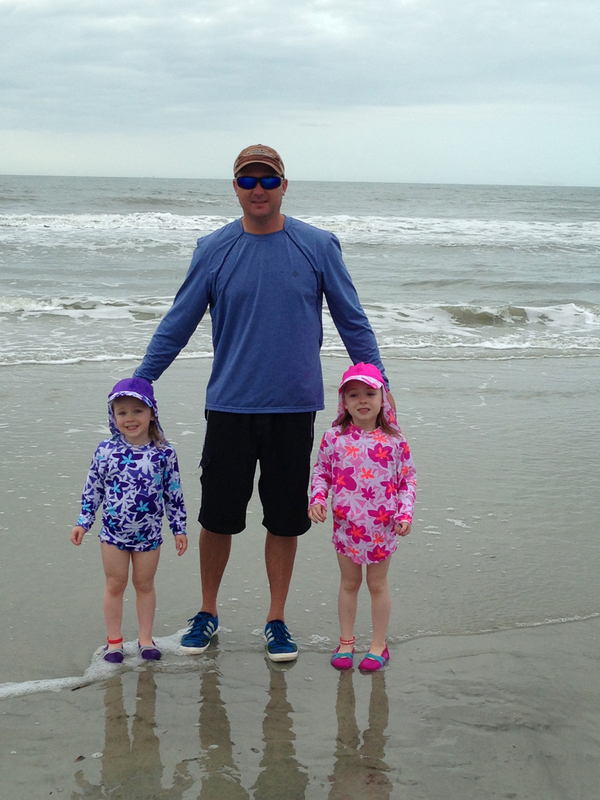 Chad Grigsby received free sun protective product for the purpose of this review. 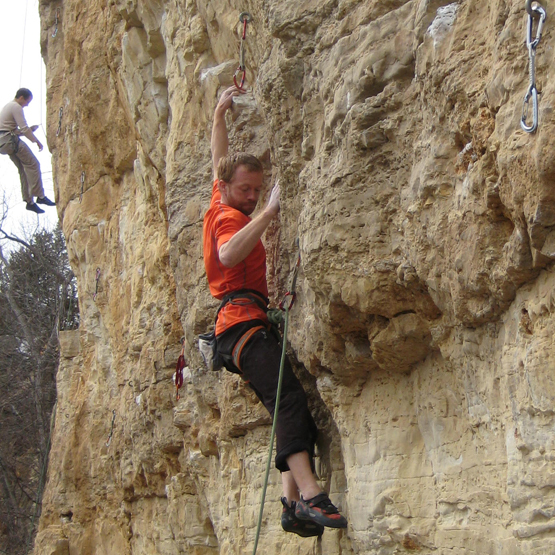 As a teacher, I get some nice chunks of time off throughout the year, and I do my best to spend these breaks doing what I love — rock climbing. This year, I journeyed west to Oregon and climbed on the welded tuff that was left over after a long ago volcanic episode. 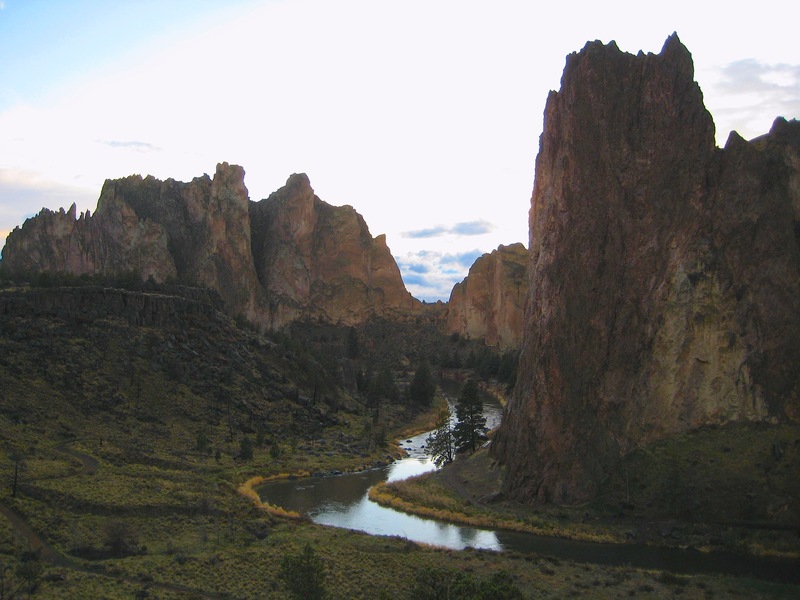 There is a really strong and interesting history of rock climbing in Smith Rock State park, and it is often sited as the birthplace of sport climbing in America. Sport climbing involves clipping pre-placed bolts as opposed to traditional (or “trad’) climbing, which involves placing your own protection in the rock as you ascend a crack system. I was fortunate enough to join a married couple and their son for this trip. Additionally, I met up with an old friend and roommate whom I lived with in Yosemite Valley when I worked there as a park ranger. 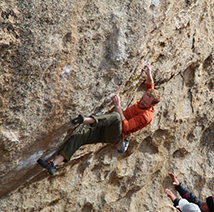 The trip had all the makings of a great time: classic climbing routes and good people to hang out with. The first day we climbed at a place called “The Lower Gorge”, where we avoided the large crowds that were enjoying their last day of spring break at some of the more popular crags (crag=cliff where people climb). Jacob, my old roommate, and I teamed up and spent most of the day trad climbing classic crack routes. Since we were both new to the area, we decided to climb routes that we could onsight (climb first try without falling) instead of trying harder routes that were on the outer limits of our ability. The day was awesome: we climbed 10 routes, each only falling once. We both flashed (climbed without falling) “Pure Palm” (5.11a), which is a route with very few holds, and involves a lot of stemming. Super classic! Unfortunately, at the end of the day on the last route I climbed, my shoulder gave a large “creak!” and was a little tweaked the rest of the trip. I’ve learned this same lesson many times before; but it’s hard to control my excitement. My mentality is to always push myself to do more, partially because I simply love climb but also because I want to get better. The lesson I took away from this experience is to quit while I’m ahead. Injuries happen when tired. Monday was a bit strange: I had two phone interviews for teaching jobs in Denver because my wife and I are relocating for her residency program in Emergency Medicine. My day went something like: interview, climb, interview, climb. I think I probably had the best view anyone has ever had during an interview as I looked out over Smith Rock from Jacob’s car. The day was a total success: the interviews went well and I sent “Ring of Fire” (5.11d) on my 2nd attempt. Tuesday, Jacob and I did a multipitch (multiple rope lengths above the ground) route called “Wherever I May Roam” (5.9, 5 pitches). The route, although easy, was enjoyable because I don’t get the opportunity to get hundreds of feet off the ground in Minnesota. He headed back to Portland afterwards, and I met up with my crew from MN. We worked on a super fun route called “Lightly Toasted” (5.11c). Dan hung the draws and made a great effort. I went next and fell at the crux (hardest part of the route). We both sent next go. The last day of the trip was one of the most memorable ones. We had a leisurely morning, each one of us catching up on our “normal” life (aka work). After lunch, we decided to head to Smith Rock for one final session of climbing. On the drive, the weather looked questionable. As we pulled into the parking lot, it started to rain. Laughing, we tossed our backpacks on and hiked down to “The Morning Glory” wall. On the way, about a dozen climbers passed us on their way to the parking lot. “Perfect!” Dan said to me. All the climbers had left and we had the entire wall to ourselves. We quickly roped up and I lead “Nine Gallon Buckets” (5.10c) which is a really spectacular route; in fact probably the best single pitch of 5.10c I’ve ever climbed. Next, we got on “Full Light Doritos Flavor” (5.12a), which is a pitch of 5.11a with a three-bolt extension. I lead first, hanging a couple times. Dan and Bronwyn both had a great time on it, making great efforts. The clouds were back to looking ominous. I quickly decided to try to send the route and soon I was well above the ground. 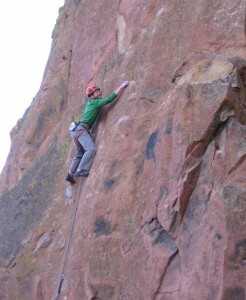 As I entered into the crux (hardest part of the climb), it began to rain. It didn’t matter. I was in the zone. All the clutter in my brain dissolved into the background. The rain spattered against the rock as the wind picked up. Moves that had felt hard the first time went smoothly. Soon, I was at the final undercling, staring the anchors in the face. I high stepped with my left foot, pushed hard on my right handhold, and reached effortlessly to the final jug. The hike out was surreal. It rained, a rainbow appeared, and then a double rainbow topped the whole day off. I smiled from ear to ear on my hike out and the trip ended in a special way. Spending meaningful time with people, seeing new sites, climbing new routes…these are the things that make me tick. Motivation is one of a few key ingredients for success. I stay motivated by having goals to train for and think about. Additionally, I try to plan some short weekend trips as well as a couple larger road trips. These are at the core of what motivates me to stay active because in order to be successful on the road, I must be prepare during the spring and summer. I think of my trips as “final exams” where I put together months of hard work and enjoy some of the premier climbing destinations and routes in the world. Once I’ve worked hard, I can truly savor each climb and know that I’ve prepared myself to the best of my ability. Thinking more locally, I always have a “project” that I am working on. In non-climber terms, this means that there is a really hard route that I am figuring out the moves on and working towards climbing it with no falls-that could happen the next week or the next year. Whatever your recreational outlet is, set a goal that is attainable but is beyond what you’ve ever accomplished before. You must also believe in yourself and your ability to attain levels that you’ve never thought were possible. My advice to anyone that is looking to stay active outdoors is to find an outdoor sport or hobby that brings you joy, satisfaction, and meaning. Getting “burnt out” out happens all too often because people do not love what they are doing. If you do not love running, don’t run. Instead, walk, play soccer, bike,….the list goes on. Try many different activities until you find the one or two that really seems to fit you, your family, and your lifestyle. At the end of the day, you should feel like you spent your time doing exactly what you wanted to do. Find some people to be active with. One of the most enjoyable parts of climbing or skiing for me is the fantastic company that I get to do those activities with. Lastly, keep a journal where you write down the date, what you did, length of time, and any other short notes you want. I’ve found the key to keeping a training log that you actually use is to keep entries really short. That way, you are more likely to continue using your training journal if it does not require much time to maintain it. This written record of activity is a good visual reminder of how many days you’ve been active in a week. 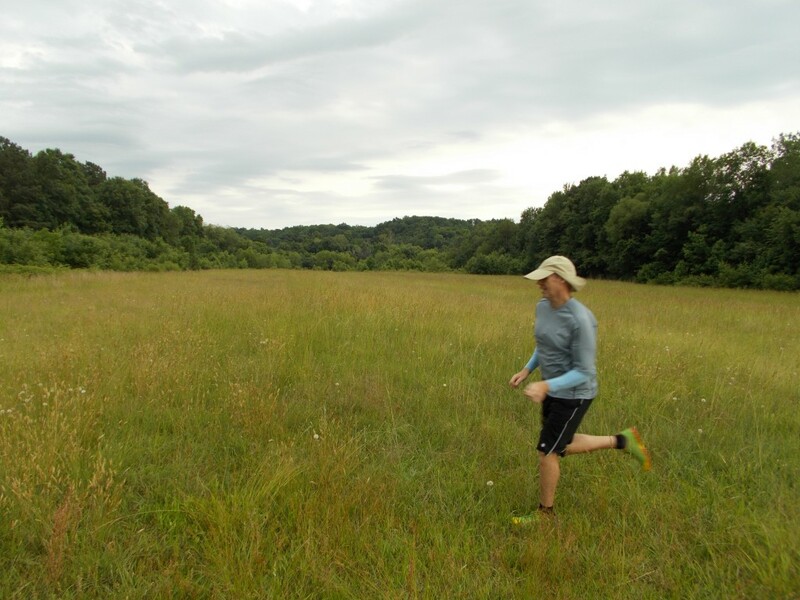 It can be a reminder that you are working hard and where you want to be or a reminder that you need to get outdoors more and get some physical activity. I started climbing shortly after I could walk, although I don’t remember much of it. My mom would turn her head for a brief moment while we ate breakfast in the house that doubled as my dad’s chiropractic clinic at our home in Minnesota. Before she knew it, I would mantel my way onto the kitchen table. Climbing was in my blood. 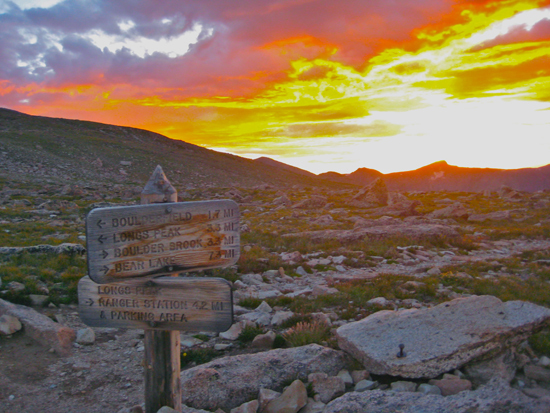 One of the first climbs I did outdoors is burned into my memory as one of those moments that changes your life forever. As I climbed Dance of the Sugar Plum Fairies at Shovel Point above the Great Lake Superior, I didn’t know it, but a whole new world had opened up to me – the vertical one. 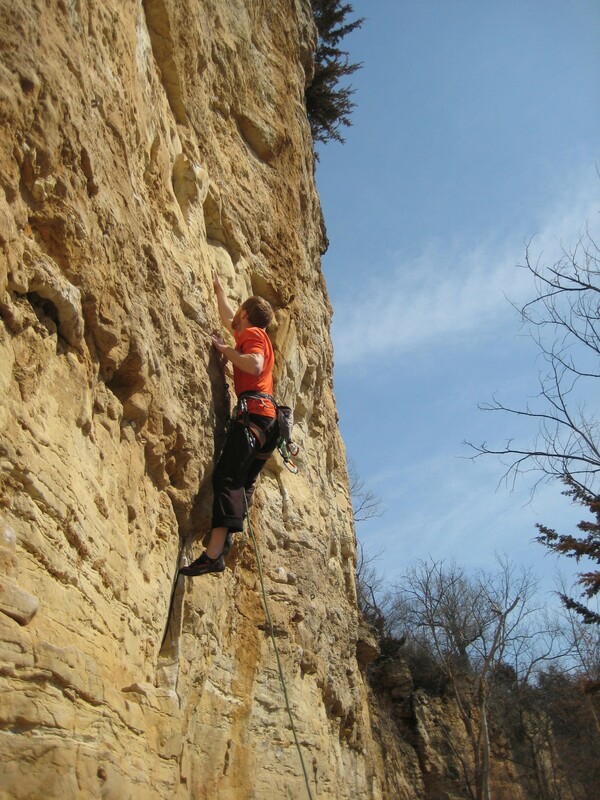 From that day onward, I would surround myself with climbing. I learned from anyone I could and got on the rock as often as college would allow. The next three years would be a steady crescendo leading to an international expedition that was funded, in part, by a grant from the American Alpine Club to establish first ascents in Valle de Cochamo of the Andes Mountains. After a successful expedition in Chile, where we established many new routes, some over 1000 feet tall, and climbed an unclimbed peak, I set my sights a little closer to home: Yosemite National Park. 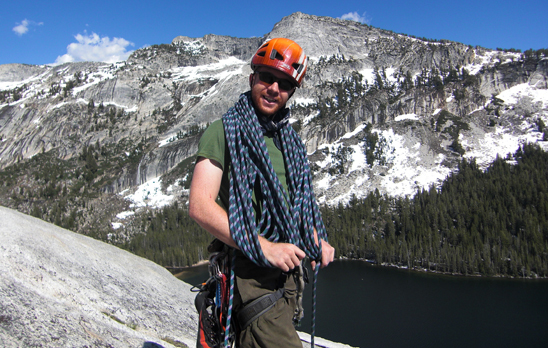 There I established an 800-foot aesthetic route on a granite point in Yosemite’s Wilderness. 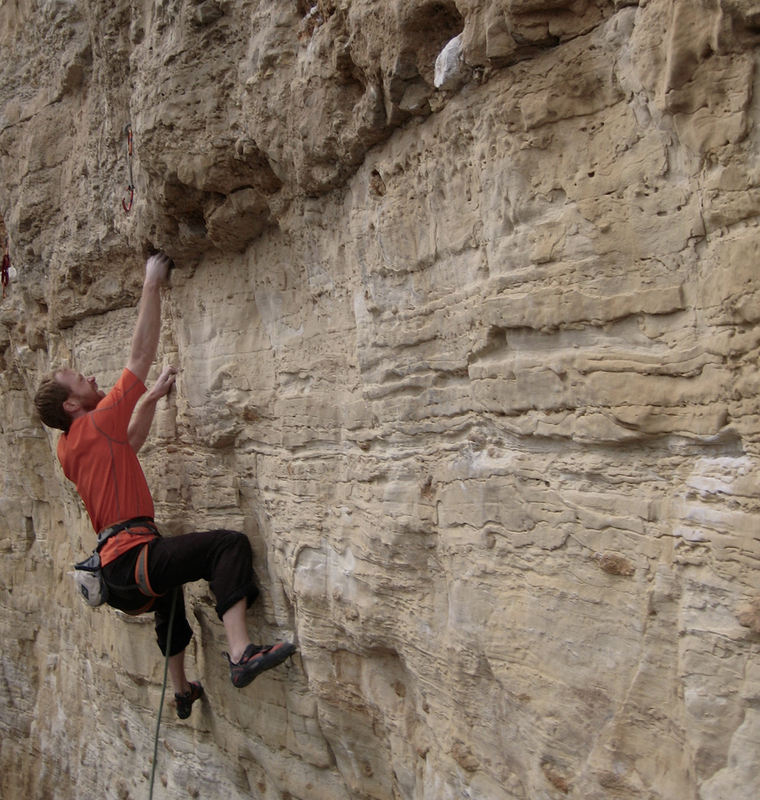 Since moving back to Minnesota, I have been focused on climbing shorter, harder routes. 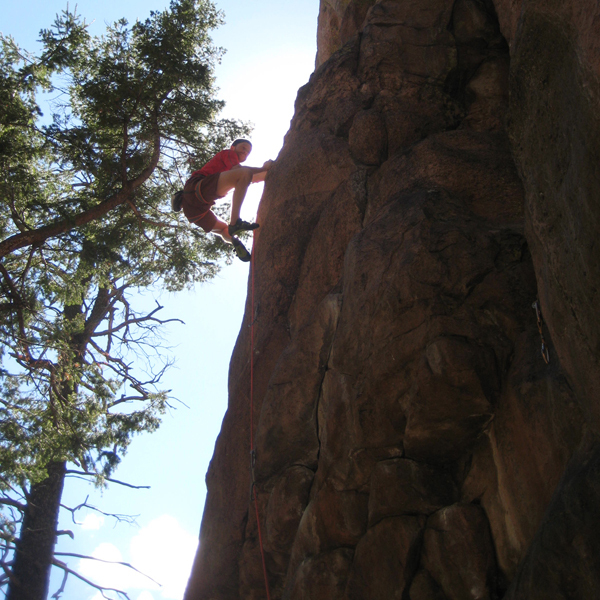 In this new endeavor, I have been successful in transforming myself as a climber and have developed a broader skill set. I’ve also learned to be ok with “failure” and think of it more so as a learning opportunity. Climbing is inspiring to me because in order to improve at it, you must be really honest with yourself about your weaknesses. I love the mental side of climbing, the amazing places it takes me to, and the lessons that I learn from it that are often applicable in other aspects of my life. I care about sun protection because in order to do what I love outside, I must protect myself from the sun’s intense rays. Another reason skin care matters to me is because skin cancer is the most common form of cancer, so clearly as a society we need to work on prevention. Outside of climbing, I am a science teacher, which is a really fantastic subject matter to teach because kids have a genuine interest in it. One of the best parts of my job is that I can use my strong connection with the natural world to inspire young minds. 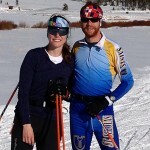 My wife and I also enjoy traveling, drinking coffee, cross-country skiing, and talking about the Norwegian Elk Hound that we hope to own soon. 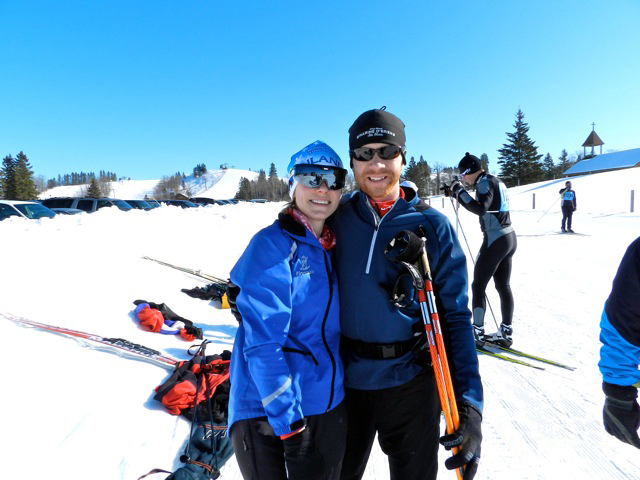 Andrea and Sevve Stember enjoy a bluebird day after completing the Buena Vista Snowjourn 12km freestyle ski race, just north of Bemidji, MN. 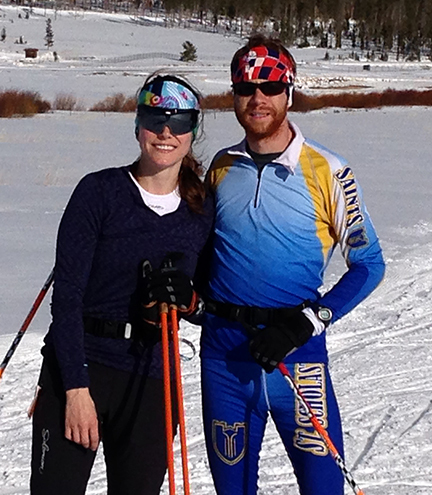 Both stood on the podium; Sevve placed 2nd overall and Andrea won the women’s division.